Protests against the president of the Democratic Republic of Congo have resulted in the arrest of 10 Catholic priests—a sign of the government’s willingness to defy church authorities at the forefront of the movement to oust its authoritarian leader. The protests against President Joseph Kabila on Jan. 21, called by the church’s Lay Coordination Committee, began after Mass and resulted in clashes in which six people were killed and more than 100 wounded, according to the United Nations. “The church deplores the excessive use of force on demonstrators who were only armed with Bibles, rosaries and branches,” said Abbé Donatien Nshole, the secretary general of the National Episcopal Conference of Congo, in a statement to RNS. U.N. radio in Congo reported coalition parties criticized the church for organizing the protests. Agence France-Presse reported a 24-year-old female religious novice had been killed when police fired on St. Francis de Sales Church in the capital's Kintambo suburb. Two nuns have also been reported missing, and more than 200 people arrested. One of those who died was a 16-year-old girl standing by a church door, AFP reported. Agence France-Presse added that similar violence had erupted outside Notre Dame Cathedral and in many of the city's 160 Catholic parishes, as protesters, accompanied by clergy, waved crucifixes and rosaries. After 33,000 migrant deaths in 24 years, will ‘Fortress Europe’ keep building walls? Congolese authorities had banned the protests. Internet access in Kinshasa, the country’s capital, was cut the day before. In protests in late December, at least seven people were killed, and altar boys were arrested. Roman Catholic bishops brokered the agreement in which Kabila, in power since 2001, had agreed to step down. That was supposed to have happened more than a year ago. 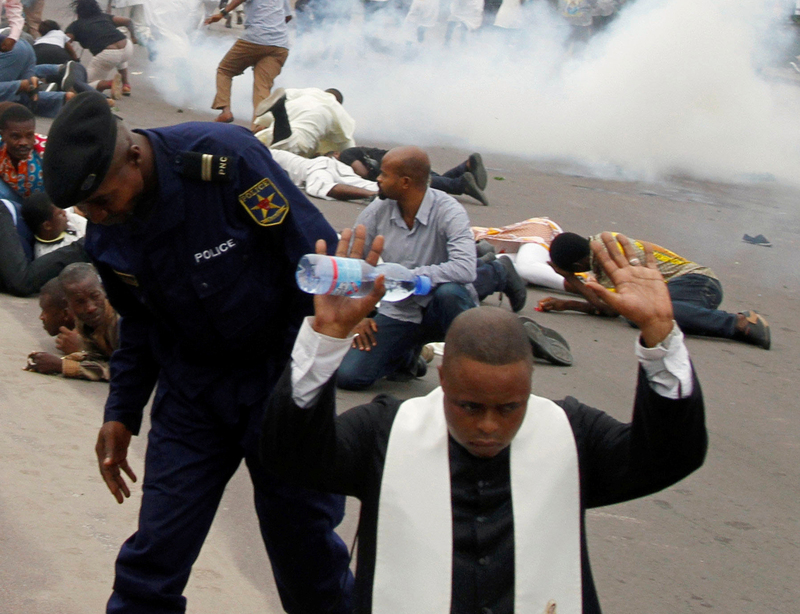 The Roman Catholic Church is powerful in the country, making up half the 67.5 million inhabitants of Congo, but the protests were also supported by many evangelical and other churches, and Muslim leaders. Kabila, who came to power after the 2001 assassination of his father, was also supposed to allow elections to be held, according to the agreement between opposition parties and him. “The purpose of the march was to claim effective and efficient implementation of the agreement of December 31, 2016,” said Nshole of the Sunday protests. Advocates for the arrested priests say they worry about their welfare. “According to information we have, they (continue) to be mistreated. Their clothes have been torn,” Georges Kapiamba, the president of the Congolese Association for Access to Justice told reporters. Speaking on Jan. 21 during his visit Lima, Peru, Pope Francis urged Congolese leaders to "do everything possible to prevent further violence and seek solutions to the common good." He led a minute's silence for victims. On Jan. 22, the Association of Bishops' Conferences of Central Africa pledged solidarity with Catholic efforts "to achieve a state of law." Muslim and Protestant leaders had backed the Catholic demonstrations in weekend statements and urged officials not to use force. This article includes reporting from Catholic News Service.